A signed, limited edition digital print, (100 in total) taken from an original artwork in acrylic. Showing the beautiful village of Alnmouth in Northumberland. 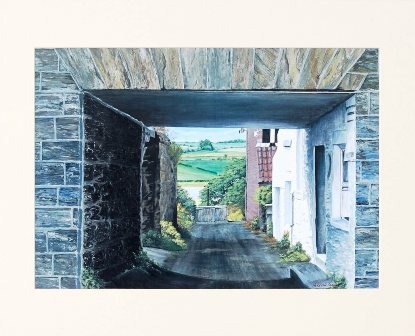 An alternative view, looking through an archway betrween the houses of Northumberland Mews. Your eye is drawn down the road, to the gate at the end, which leads to the estuary, where fishing boats travel by, leading up to the beautiful green landscape beyond.